Concealer can be a hard product to shop for at the drugstore, much like foundation. Not only do you have to worry about shade matches, but there are so many finishes and coverage options to use for different purposes in your routine. As someone who has the pleasure (not) of experiencing acne and dark spots, concealer has become a permanent fixture in my beauty routine. I use concealer most for covering problem areas, but also for brightening the under eye, defining my brows and creating cut crease eyeshadow looks. 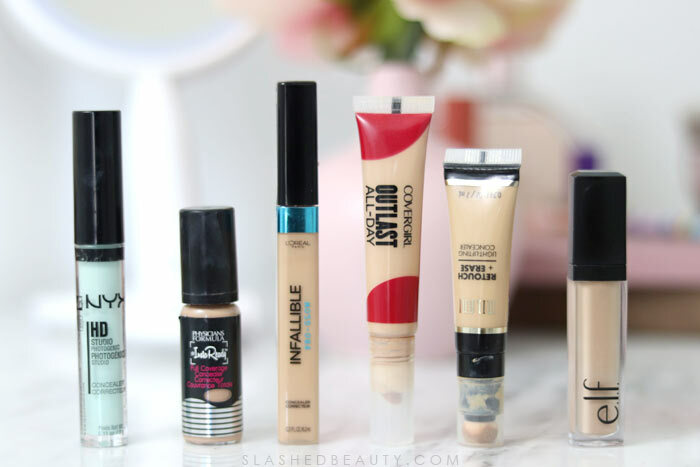 Out of all the products I’ve tried over the years, these are the current best drugstore concealers. 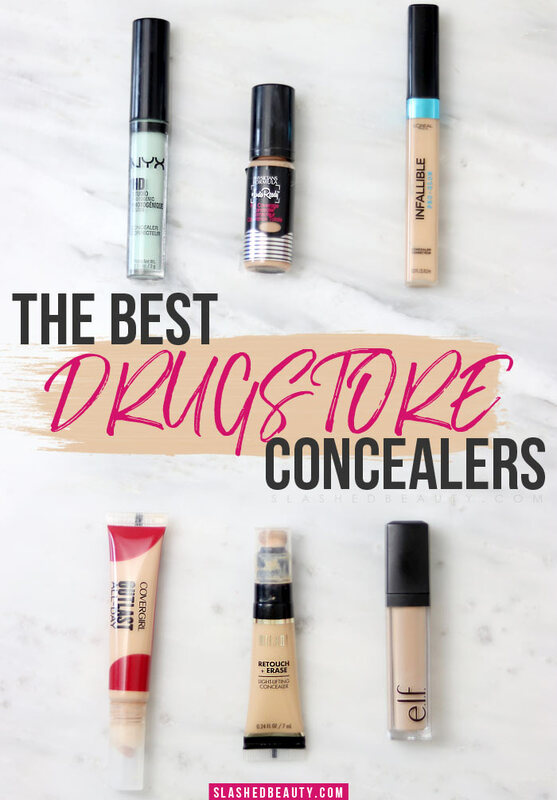 Keep reading to hear what I think are the best drugstore concealers and what they’re best used for. One of my all time favorites, the NYX HD Photo Concealer is an affordable powerhouse. Not only does it have great coverage, but one of its strongest selling points is the fact that it comes in 28 shades so you are bound to find a close match. That includes three color-correcting shades, like the one pictured in green. This is my most-used for acne. I spot conceal any redness, which is neutralized by the green, then cover my foundation for an even finish. I love the creaminess and blendability, and it never looks dry or cakey with other products layered on top. When I need full coverage that won’t budge, I reach for the Physicians Formula #InstaReady concealer. I used this on my wedding day to help cover stress acne that popped up the night before (of course!). You hardly need a pea sized amount— a full pump is already too much. So don’t be fooled by the small packaging, this will last you a while. It has a natural finish with coverage that has lasted me 9+ hours of being active. It also comes with a blending sponge to help with application. This is a new addition to my collection, but an instant favorite. I was already a huge fan of its counterpart, the Infallible Pro-Glow foundation, so I’m not surprised that I fell in love with the concealer. It has the same great coverage that’s medium-full and buildable, plus the luminous finish that helps brighten the skin. This is another one where you really don’t need a lot to get the job done. I’ve most often been using this for defining under my brows and concealing acne when paired with the foundation, since the finish is the same. When you need a concealer that’s not going to crease, the COVERGIRL Outlast All-Day has you covered. That’s why I often use it for my cut crease eyeshadow look, since I know it won’t migrate into my lines. It has light/medium coverage that dries down to be matte— I would recommend it for oily skin, especially if other concealers tend to slip off of you. The Milani Retouch + Erase concealer is another matte product but with more coverage than the COVERGIRL one. It’s medium and buildable, and the built-in sponge applicator makes it easy to dot onto your face. I don’t typically blend it using the product itself, but patting it in with my fingers really warms up the creamy consistency for easy blending. It’s a great do-it-all concealer for both around the eyes or any unevenness. You’ll get the most bang for your buck with the e.l.f. HD Lifting Concealer… if you are in the light to light/medium skin tone range. Unfortunately, this concealer only comes in three shades: Fair, Light, and Medium. 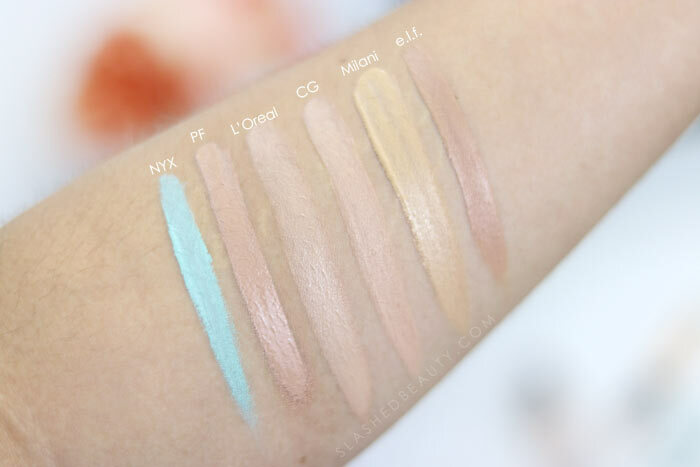 In my opinion, the shades are weirdly labeled because Light is far more like a medium shade, and is even a smidge dark on me– see the swatch photo above. Regardless, if one of these is a good match for your skin or at least to highlight with, I highly suggest picking it up as it gives a very natural looking radiant (but not dewy) finish with medium/full coverage. I use this to conceal acne paired with demi-matte foundation, as well as clean up my brows. 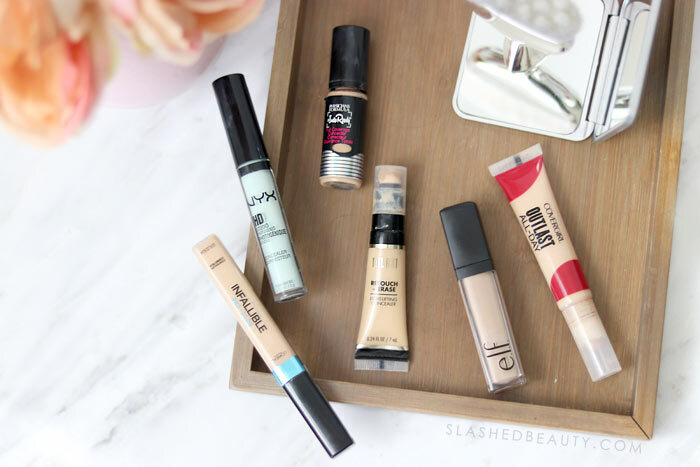 What are your favorite drugstore concealers? How do you use them in your routine?